b. Asking an interpreter to replay the instructions to the patient. 15. The physician orders heparin, 7,500 units, to be administered subcutaneously every 6 hours. The vial reads 10,000 units per milliliter. The nurse should anticipate giving how much heparin for each dose? 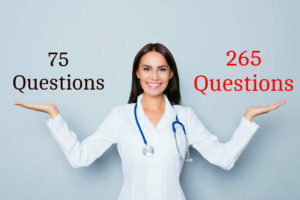 Please check the questions carefully before you post it… I am pertaining to the question No.29… I would love if the male has a uterus now… Male patient scheduled for “Total abdominal Hysterectomy”….????? Question 29. If this patient really had a total abdominal hysterectomy, I would love to talk to the MD. As the question states “male patient”. Perhaps the nurse should double check her room to ensure she is in the right patient’s room.